Oh, it’s not particularly popular with you, but it’s fairly popular with me, which is why it pops up so often, and also why I have, what?, six regulars. But having said that, I haven’t actually done one of them in months and that’s not just because I was in one particular location and was told I may not snap photos in the store. Anyway, before we’re both permanently barred from all 99¢ Only stores everywhere, I figured I’d better start giving you a daily (and with me, folks, “daily” usually ends up being once every eight or nine days, if we’re lucky) rundown of what is and what was bueno at the 99¢ Only store! These may not look like much, but let me tell you, I’m glad I picked up a package – though I’m more upset I didn’t pick up a bunch more. Like you, I am delighted that the package doesn’t describe them just as “cookies,” but rather “crispy cookies.” And, brother, they are. They are! 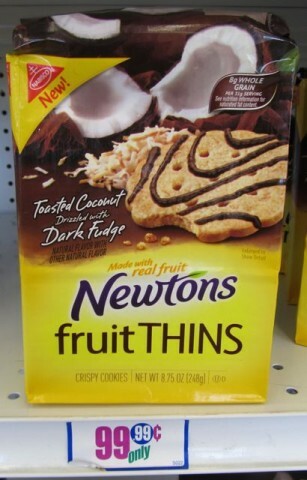 Oh, sure – you’re seeing “Newtons” so you’re thinking “figs.” Well, Nabisco doesn’t give a fig what you think, because you’ll find nary a fig in these babies. No, the only thing here is a crisp cookie biscuit with toasted coconut baked right in – and then they’ve gone and bedrizzled it with dark fudge. I speak for all of us when I say we didn’t see that coming! Now, I’m no package design professional, but seems to me that they could have saved their printer a whole bunch of typesetting [industry term] if they just used the latest advance in package copy, the letter S. “Natural Flavors,” plural. Boom – you’re done. ‘Course if it wasn’t for this obvious copywriting screw-up, they probably wouldn’t have ended up at 99¢ Only, so I won’t complain too loudly (though I do feel bad for whoever lost their job over this one). Tomorrow*: Another item that is bueno! *Probably in eight or nine days. Posted by Ted on January 18, 2014, 4:08 AM.